The night before our last day, it snowed five inches and then just kept coming down; I didn't get any photos of that because I was too busy playing in the snow (and also I didn't think my camera would like getting snowed on). 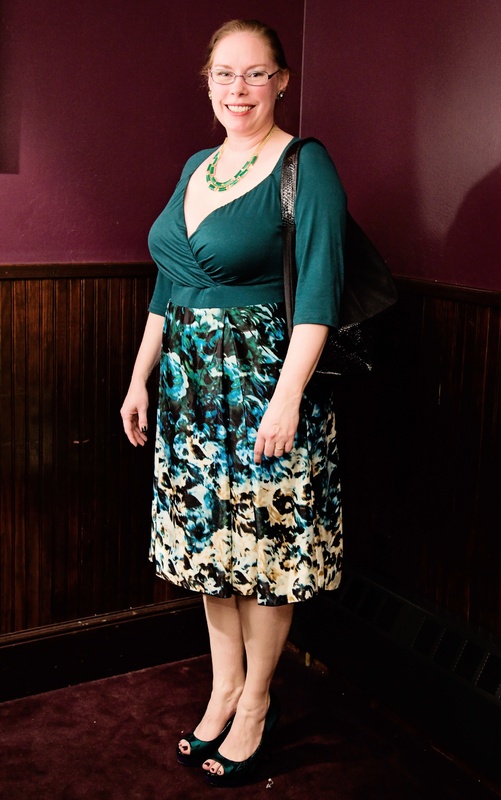 To see me in the other dress (and get a glimpse of the fabulous glittery shoes I wore with it) and enter to win a $50 Igigi gift certificate, head on over to my review on my other website (there's also a link there to find other reviews where you can get more chances to win). International readers are welcome to enter, just make sure that Igigi will ship to your location (you can check here). 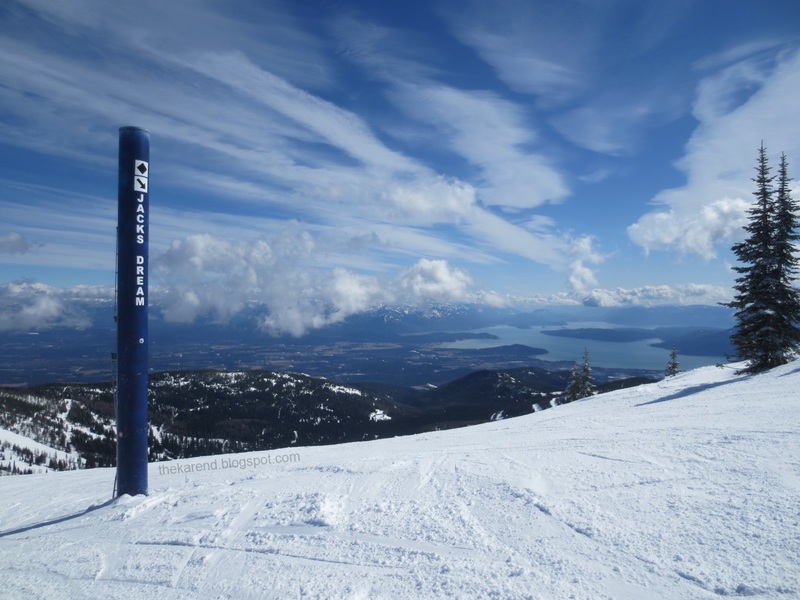 Deadline is April 20, 2014. 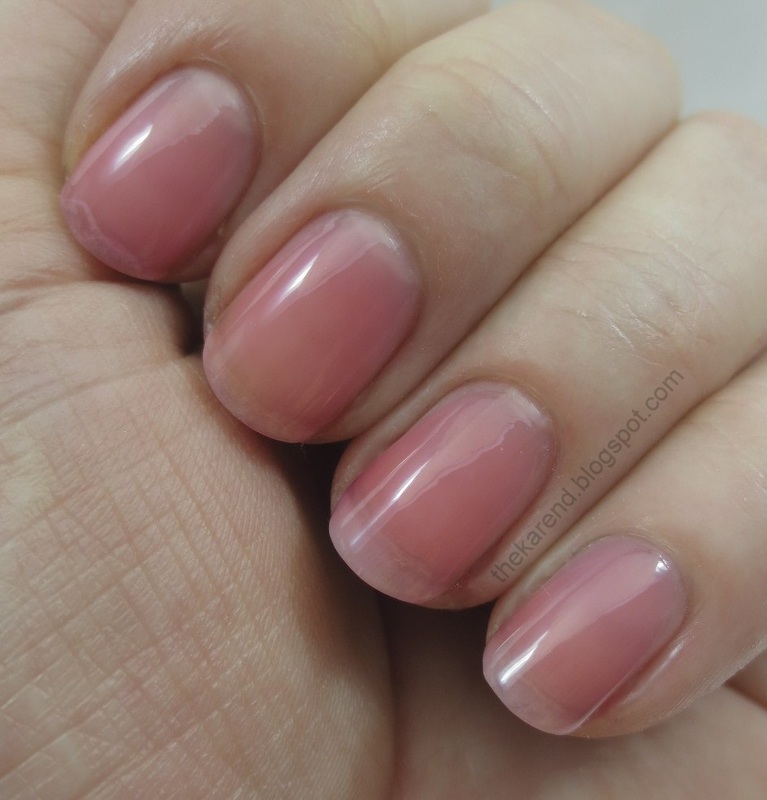 As promised in my post about the Sally Hansen Palm Beach Jellies, today I have many comparisons of sheer polishes. (I was aiming for yesterday but had to work through lunch, which is my prime blog post writing time.) 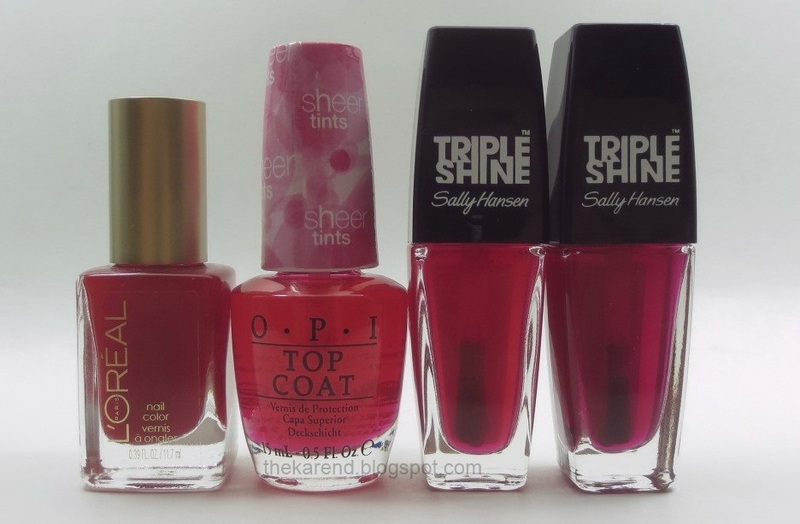 It all started when I had the OPI Sheer Tints sitting next to the Sally Hansens in my "to be swatched" corral and noticed the OPI pink, Be Magentale With Me (note: not magenta), and one of the Sally Hansen pinks, Water Melon, looked very similar. I thought "aha, a dupe", but this was before I'd swatched either one, and as we know, you can't necessarily count on the bottles to tell the whole story. Then I thought to myself, "hey self, do you think you can find the Maybelline water ones? I know they're not a wheel yet, so it might not be easy, but it sure would be nice to see how this iteration of the sheer trend compares to that earlier one". Surprisingly, I did find the waters, in a Helmer drawer with a label that actually reflected what was in it, rather than a box crammed with random stuff waiting to be sorted. 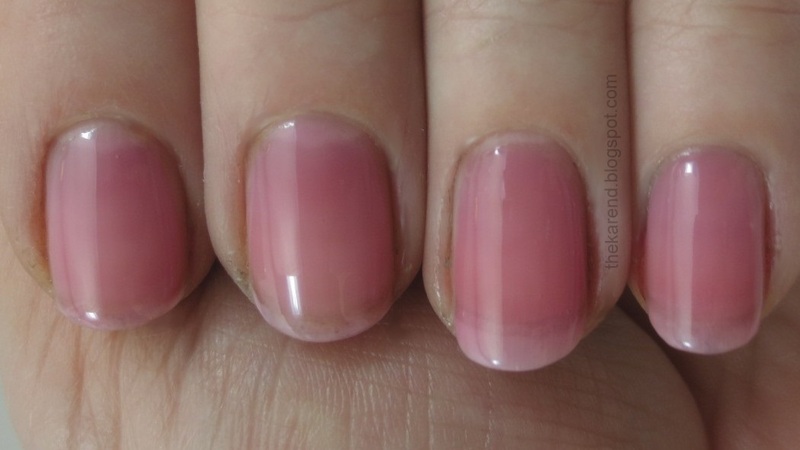 Thus Maybelline Express Finish Berry Water joined the pinks for some comparison fun. 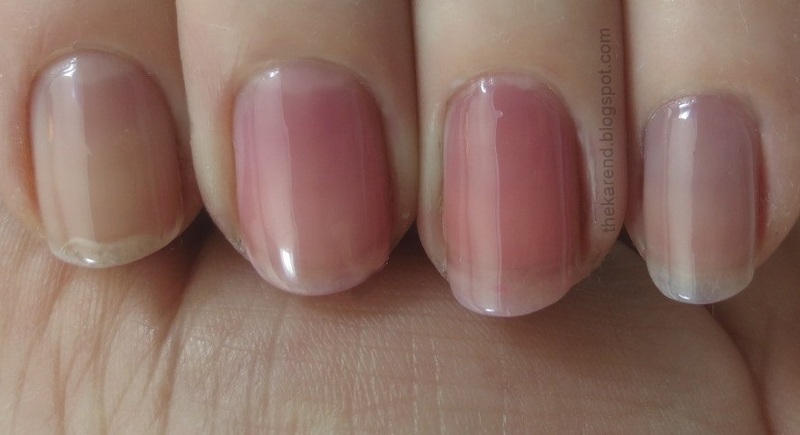 The Maybelline's formula is very thin, so I used three coats. It's on the left below, and you can see that it gave me a better color payoff than either the OPI (middle, only two coats but we've talked about how thick it is so more coats is not something I want to do if I don't have to) or the Sally Hansen (right). Maybe it's all the super chemicals they could use back in the days that Maybelline was made. 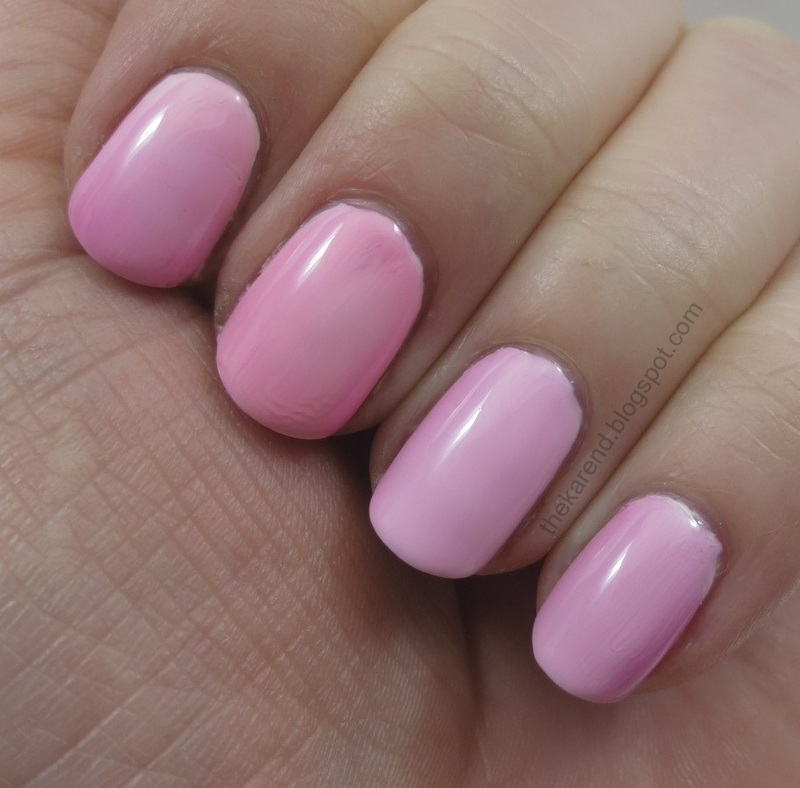 For sheerness reference purposes, I swapped out the Maybelline for one of the L'Oreal Miss Candy Gellies, Jolly Lolly, and let Sally Hansen Jell-ous join the party since it was pink, too. Starting at the top with the L'Oreal, here they are on the nail. All are two coats except Jell-ous on my pinky, which is three. 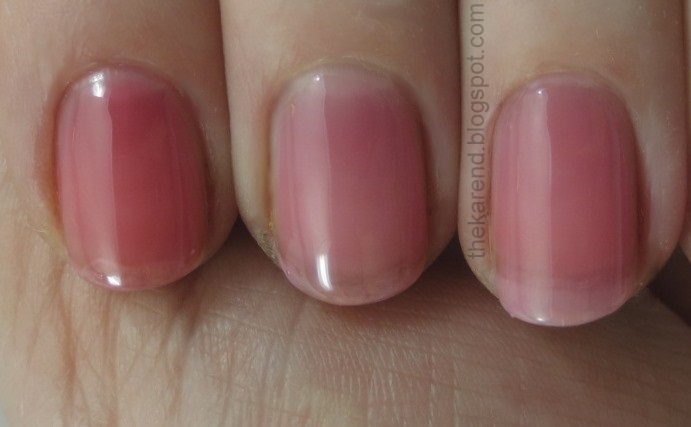 This shows the difference between a jelly (the L'Oreal) and a tint/water/sheer jelly/whatever we're calling the transparent ones. 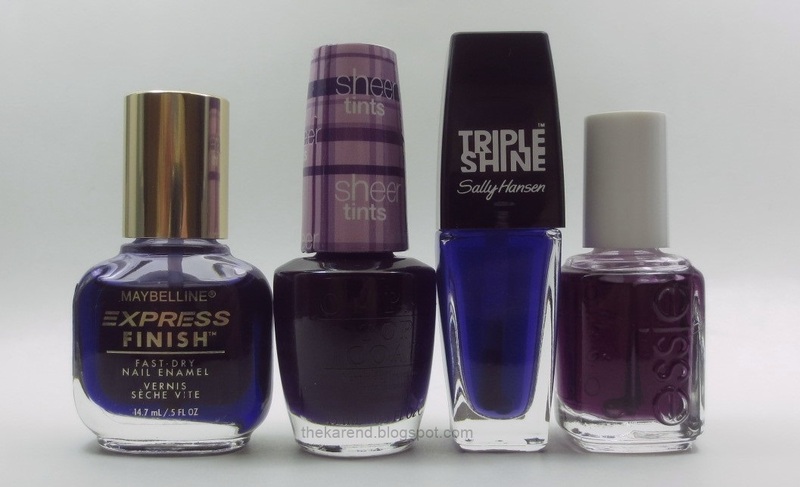 Based on looking at the bottles, the closest things in my stash to Sally Hansen Jell-ous were Essie Burgundy Syrup and Maybelline Plum Water; I grabbed Essie Grape Crush as well since I have four fingers, after all. The Essies were part of a collection of "glazes", which had six sheer colors (the others are Raspberry Seltzer, Night Cap, Cherry Pop, and Apricot Fizz, none of which I own). Below, same order as the bottles, three coats of each. You can see that the Essie ones are even more sheer than the Sally Hansen, and the Plum Water is not as pigmented as Berry Water was. For the yellow and orange comparisons, I grabbed Maybelline Lemon Water, OPI I'm Never Amberrassed, Sally Hansen Vitamin D-light, and Maybelline Orange Water. My bottle of Lemon Water had settled and despite much shaking, I couldn't completely dislodge the clump of pigment that had formed. If it were a color I thought I'd use even semi-regularly, I would have found my extra balls and added one to see if that would do the trick, but you can see by the level that I have barely touched this in all the years it's been in my stash. Here they are on the nail, in the same order as the bottles above. All are three coats except the OPI, which is two. I wonder if mixing in the rest of that pigment in the Lemon Water would have made it closer to the OPI. Orange Water certainly has better coverage than the Sally Hansen. Since I'd grabbed all the L'Oreal Miss Candy ones when I got the pink one, I went ahead and let them get in on the yellow/orange comparison fun, too. 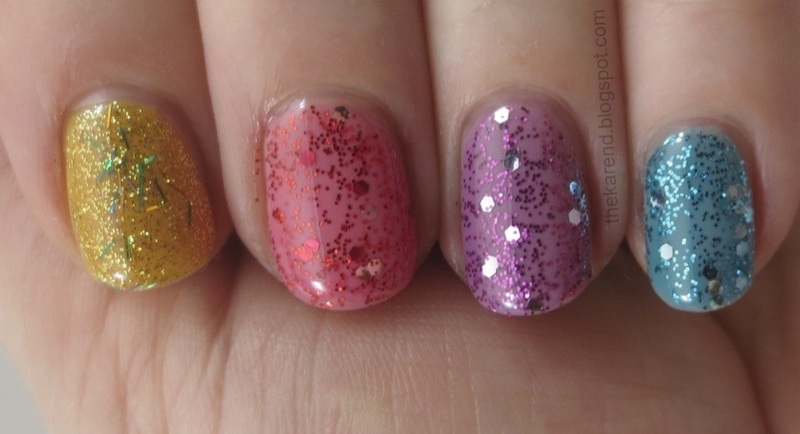 Left to right: L'Oreal Bananarama Love, OPI I'm Never Amberrassed, L'Oreal Mango Mamma, Sally Hansen Vitamin D-Light. On the nail, the orange L'Oreal was the opacity winner, which wasn't surprising since yellow is a lighter color by nature and we know by now how sheer the Sally Hansens are. I used two coats of all but the Sally Hansen, which was two. Turning to the purples, I lined up Maybelline Violet Water, OPI Don't Violet Me Down, Sally Hansen Grape Jelly, and Essie Grape Crush. 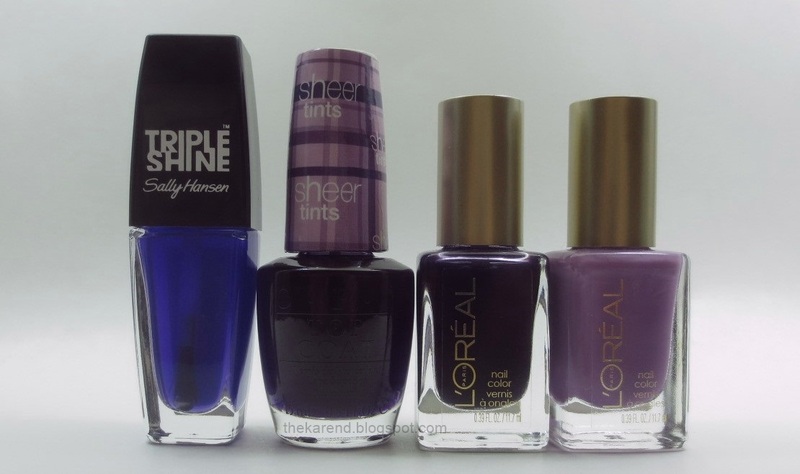 You know the drill by now—I put them on my nails in the same order as the bottles. All are three coats except the OPI, which is two. 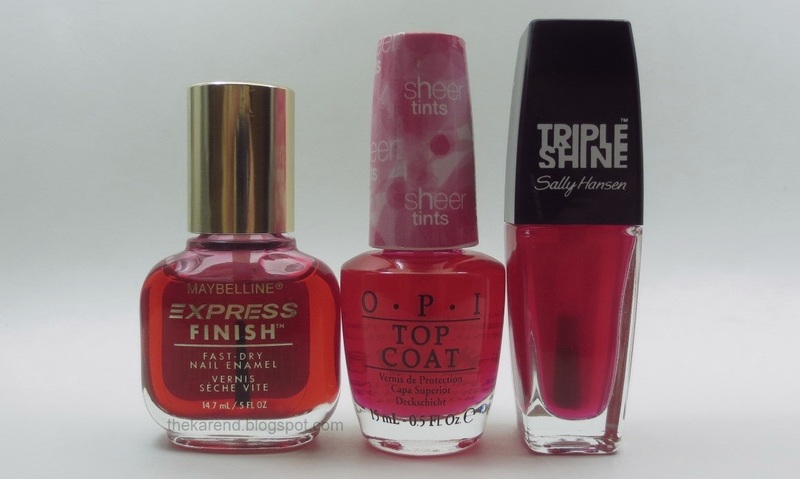 The Maybelline (far left) is what I was hoping the Sally Hansen would be. The OPI is a warmer purple. The Sally Hansen and the Essie are neck and neck in the competition to see who can look the most like clear topcoat. Bringing the L'Oreal jellies in, the lineup changed to Sally Hansen Grape Jelly, OPI Don't Violet Me Down, L'Oreal Berry Nice, and L'Oreal Lilac Coolers. I did four coats of the Sally Hansen (top finger in photo below) to two coats of the others. That deepened the color some, but it still wasn't as opaque as any of the other three purples. In the department of see through blues, I only have three: Maybelline Blue Water, OPI I Can Teal You Like It, and Sally Hansen Ice Tint. 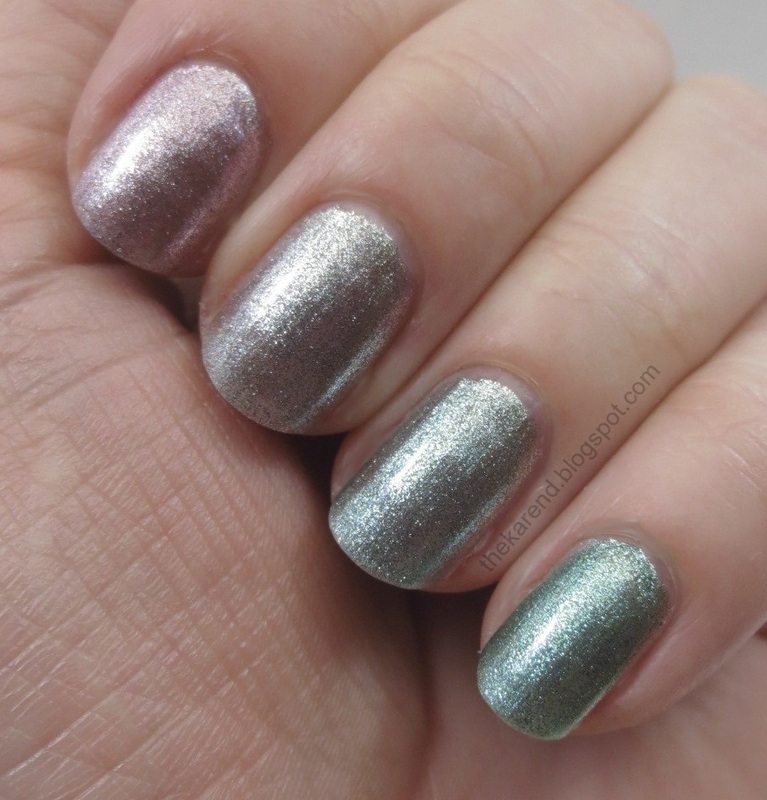 These are all similar hues on the nail, though the OPI (middle) is much darker at two coats than the others at three coats. 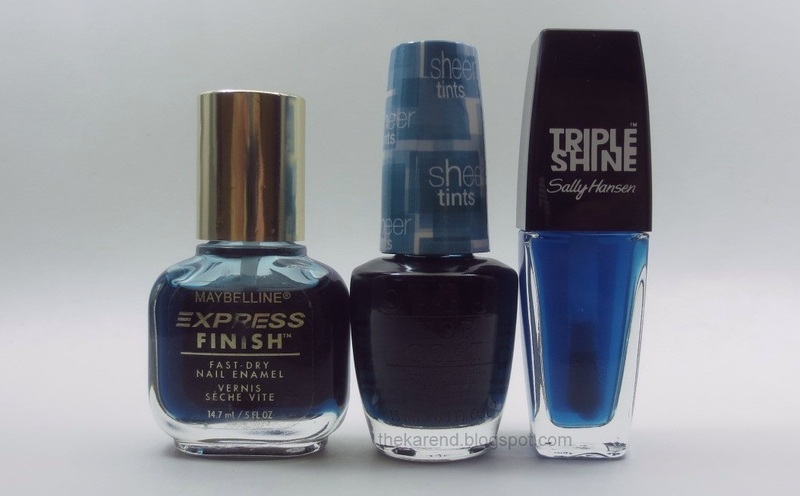 The Maybelline not surprisingly shows more color than the Sally Hansen. For the jelly portion of the blue program, I brought in L'Oreal Miss Pixie. Top to bottom below, it's Sally Hansen (4 coats), OPI (3), L'Oreal (2), OPI. 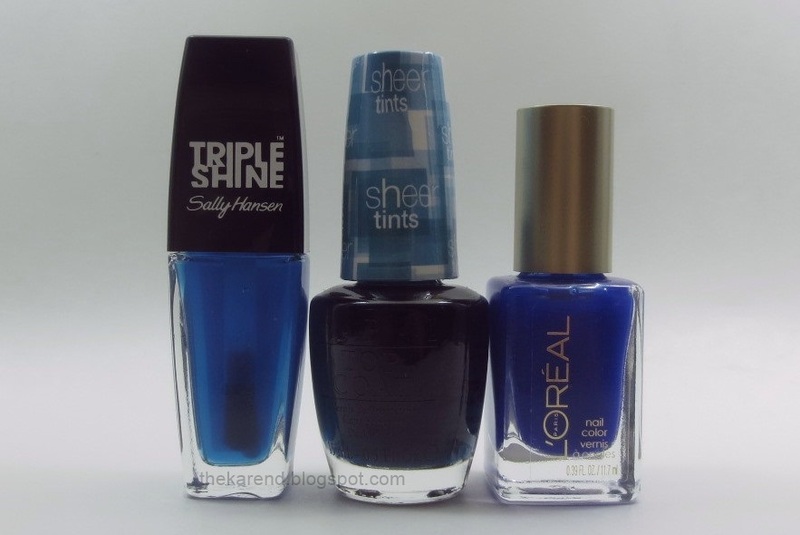 The Sally Hansen looks more green on the nail than in the bottle, while the L'Oreal maintains its true blue hue. And finally we come to the greens, where I had so few the jelly got into round one. 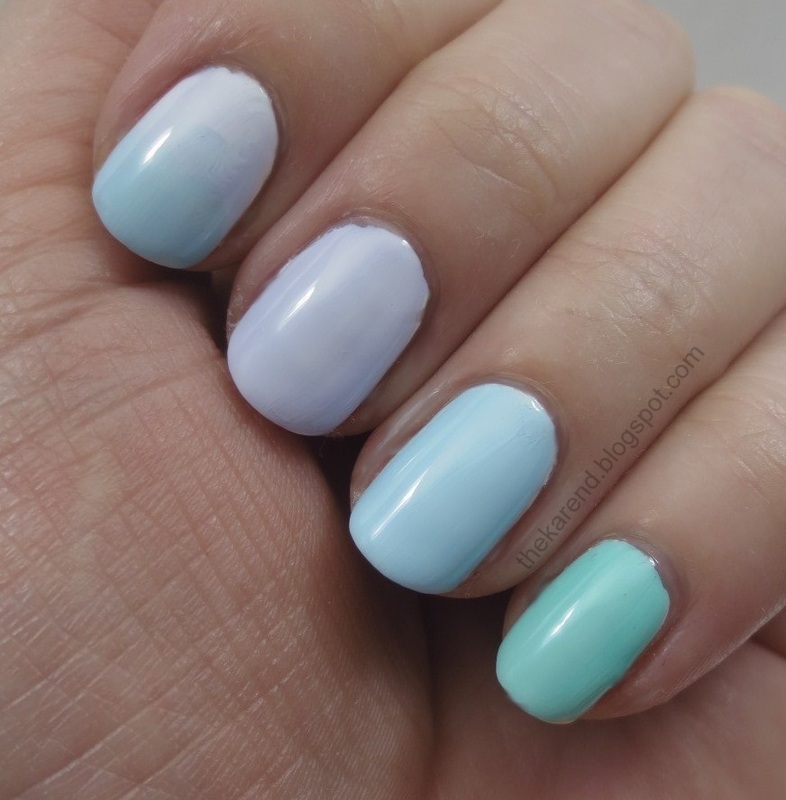 Left to right: L'Oreal Crème de Mint, Sally Hansen Sea Through, and Maybelline Emerald Water. On the nail, top to bottom: L'Oreal (2 coats), Sally Hansen (3), Maybelline (2), Sally Hansen. 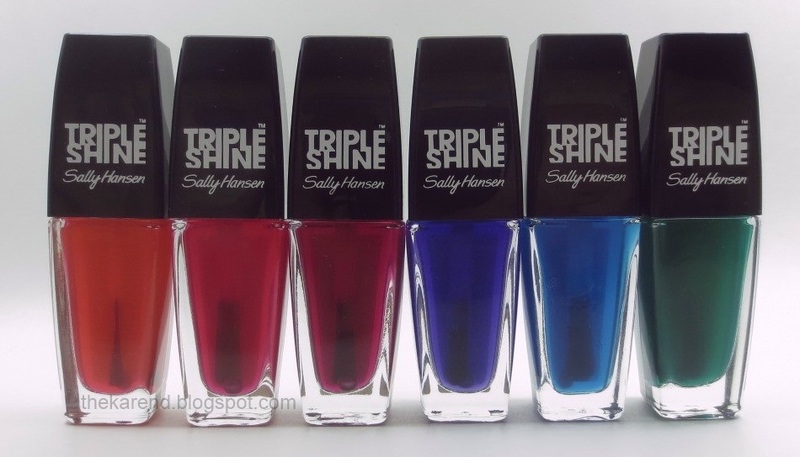 The Sally Hansen holds its own against the Maybelline in opacity; in hue, the Maybelline is a touch darker and more blue leaning. 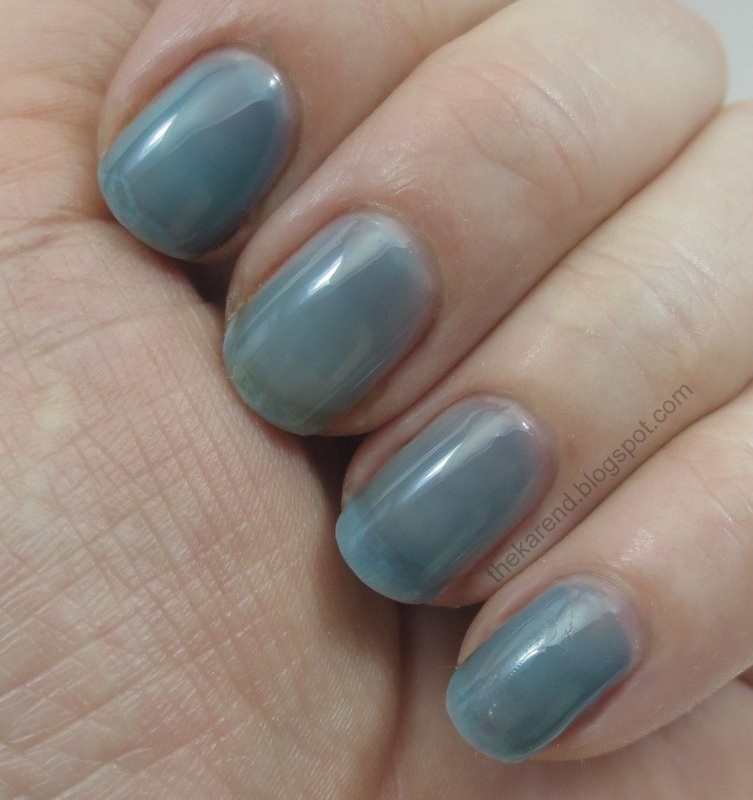 Even though the inspiration for these comparisons was to see how the new OPI and Sally Hansen sheers stacked up against each other, doing them reminded me how much I liked the L'Oreal jellies, and how much fun some of the stuff Maybelline did back in day was. I guess it's good that I liked the stuff already in my stash, though if I hadn't maybe I'd find it easier to let go of stuff and not have overflow in boxes all over my basement. (Well, not all over, it just seems that way to Mr. Karen). I hope this helped you decide which of the new spring sheers you might want (or inspired you to reacquaint yourself with your own older jellies or sheers). Nail Wheel Wednesday is going to stay on hiatus today so I can share some polishes that are so new to my stash that the display hasn't made it into a display post yet—the Palm Beach Jellies from Sally Hansen, six limited edition sheer colors in the Triple Shine line. 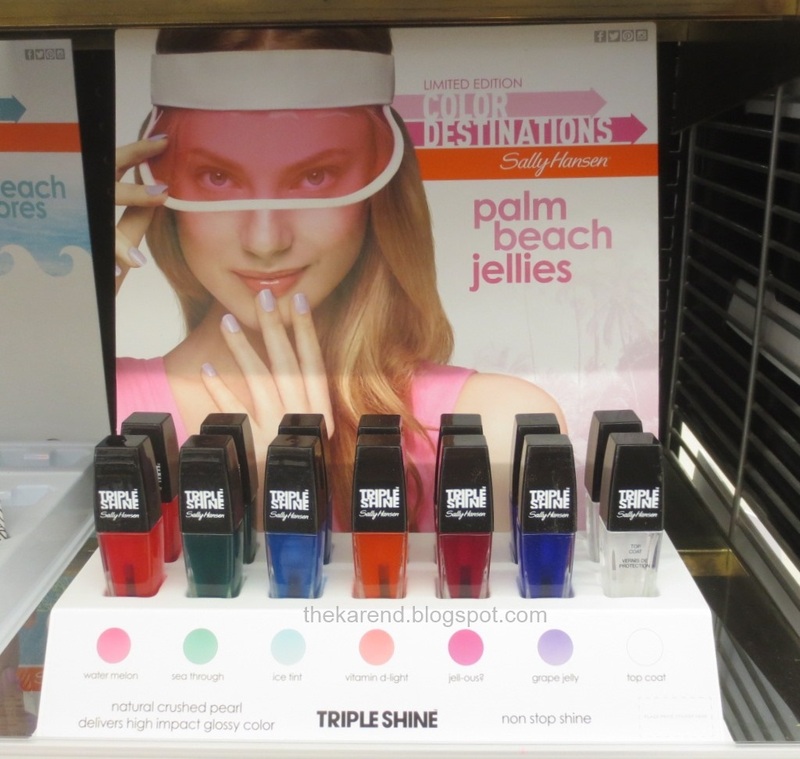 Before I get to swatches, here's the display, which I found at Meijer earlier this month. Colors left to right: Water Melon, Sea Through, Ice Tint, Vitamin D-light, Jell-ous, and Grape Jelly. Because these seemed to break nicely into two groups of three, and because I did not have the time or the patience to swatch them individually, I did Skittles, starting with the three warm shades. 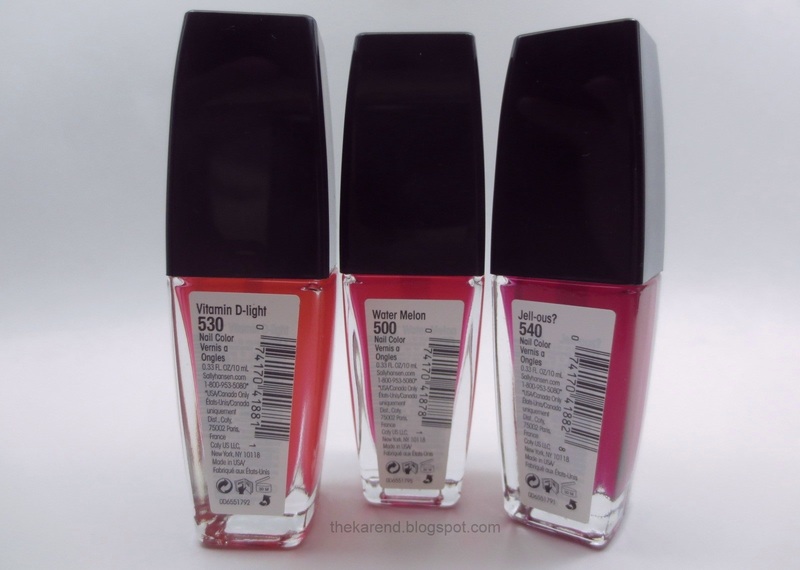 Vitamin D-Light is a red-leaning orange, Water Melon is a warm medium pink, and Jell-ous is a deep rose pink. 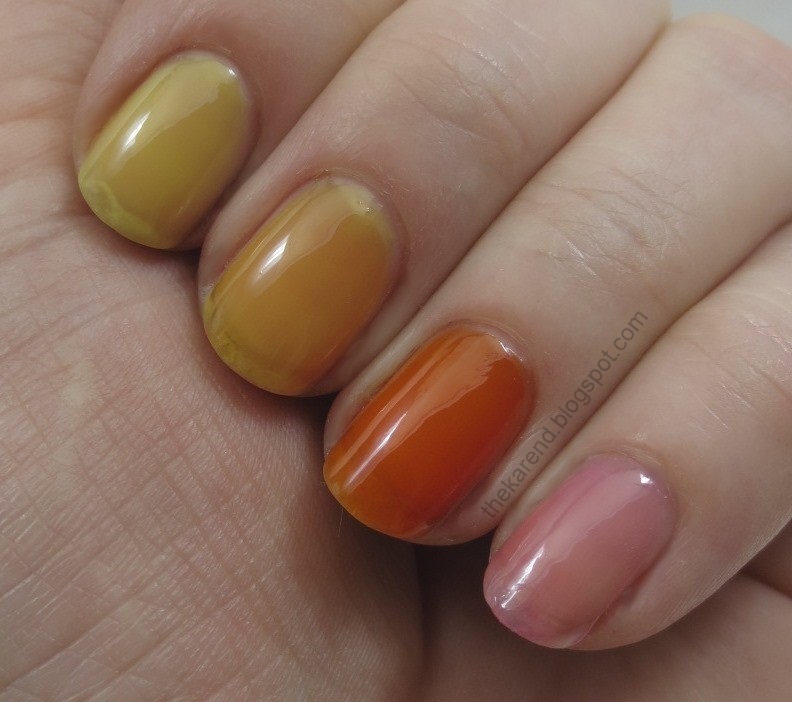 Top to bottom: all three warm shades layered on top of each other, Vitamin D-light (3 coats), Water Melon (2 coats), and Jell-ous (3 coats). You can see that these are very sheer. 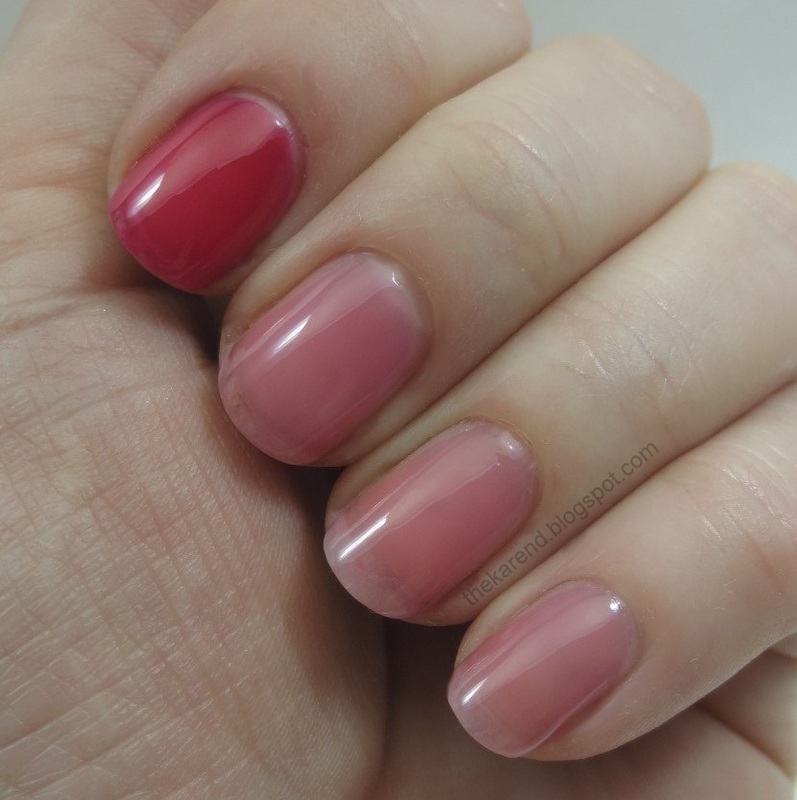 Water Melon is the most pigmented; that needed two coats to reach the same level of opacity as three coats of the other warm hues. The formula on these is much thinner than the OPI Sheer Tints, more the consistency of a regular topcoat. Perhaps if I'd gone to five or six coats, I would have gotten closer to bottle colors and these would have looked less alike, but I lack the attention span for that many coats of the same thing. I wouldn't wear these on their own anyway, what with the sheerness showing off Mr. Peelies' shenanigans. I moved on to the cool colors: Grape Jelly, a purple, Ice Tint, a deep sky blue, and Sea Through, a green. 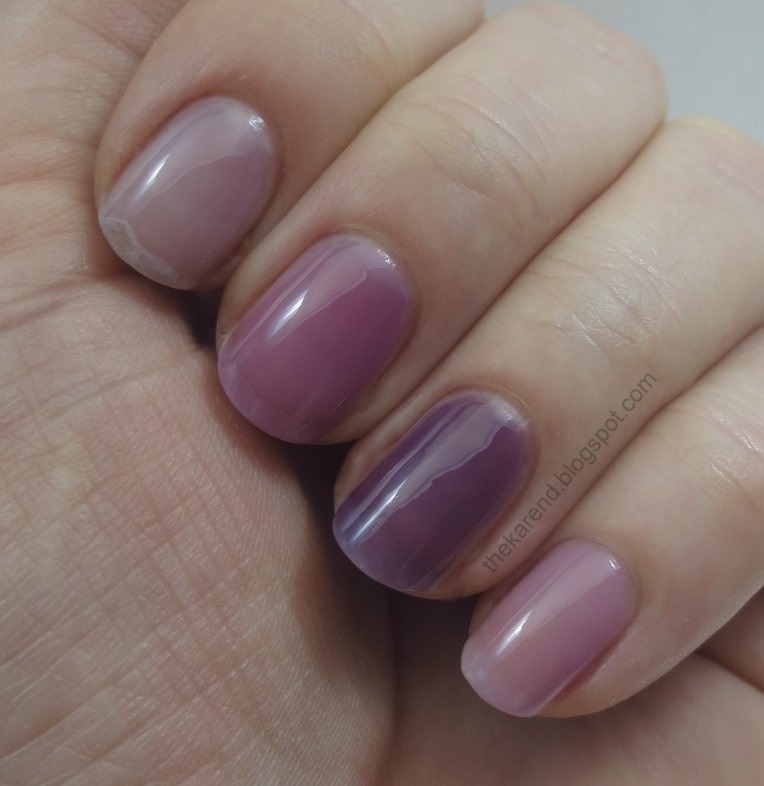 The cool shades on the nail, top to bottom below: gradient with all three, Grape Jelly (3 coats), Ice Tint (3 coats), and Sea Through (2 coats). As Doge would say, such sheer. 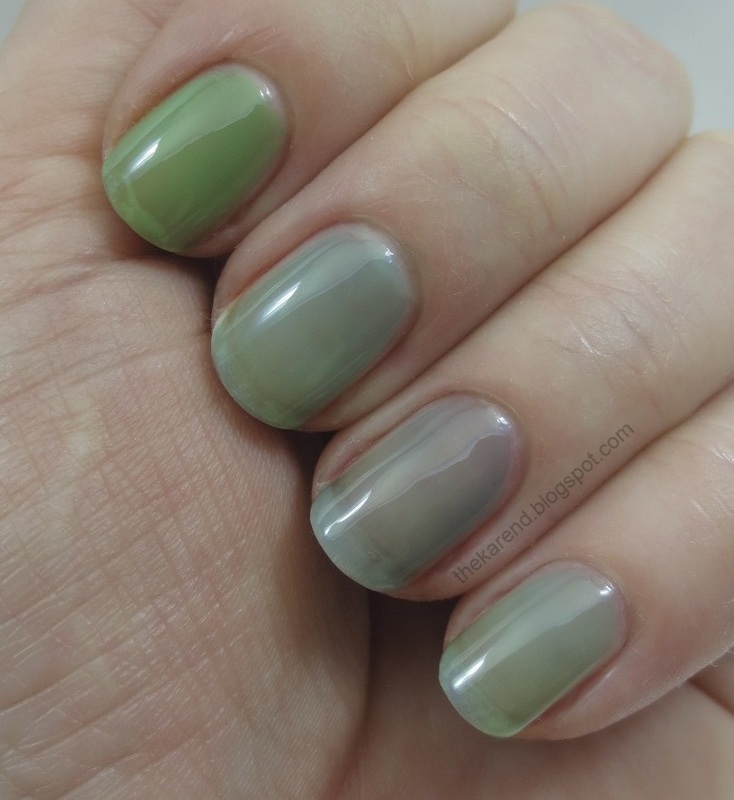 The thin formula does make it easy to make smooth gradients without a sponge, but the sheerness makes the overall effect barely visible anyway, at least on bare nails. Of course I had to try these layered. Here are the warm colors over Sinful Shine Wisp (which, yeah, I didn't let dry quite long enough before adding the jellies). 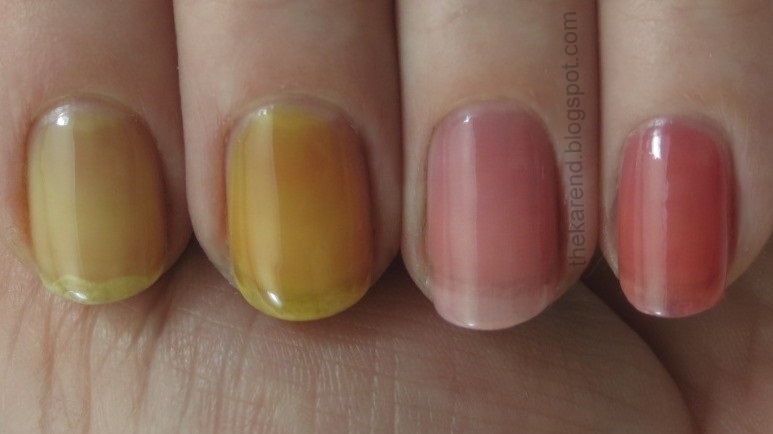 Top to bottom: gradient with all three, 3 coats of Vitamin D-light, 2 coats of Water Melon, and 3 coats of Jell-ous. Looking at this, I find myself wishing the Vitamin D-light was more orange and Jell-ous more red or orchid or something to distinguish it more from Water Melon. And now the cool colors. 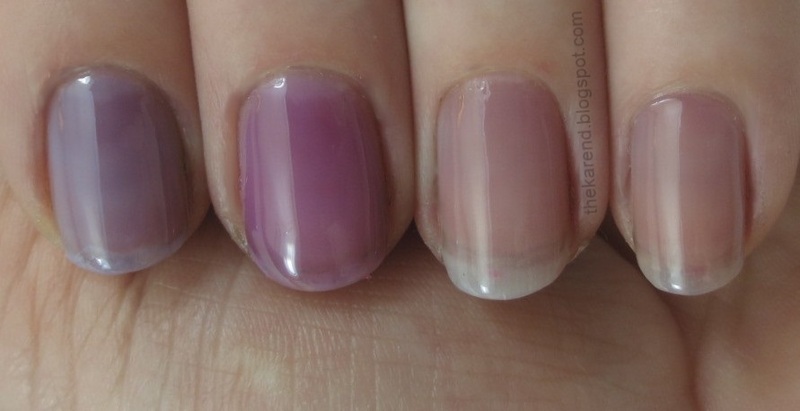 Top to bottom: gradient with all three, then 3 coats each of Grape Jelly, Ice Tint, and Sea Through. Worn this way, these colors look soft and pretty and very spring-like to me. Since the three warm colors were nearly the same, I only used one of them when it came time to try these over silver (the same as in yesterday's post, OPI Your Royal Shine-ness. 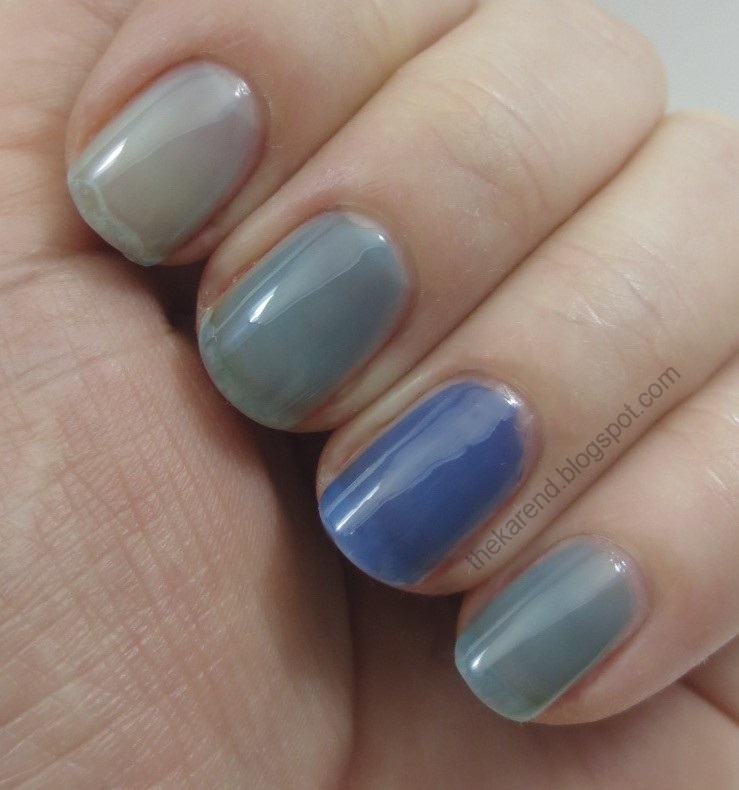 Top to bottom (three coats of each): Jell-ous, Grape Jelly, Ice Tint, Sea Through. Grape Jelly barely shows up against this silver; that made me a little sad. Sea Through was my favorite over the silver. 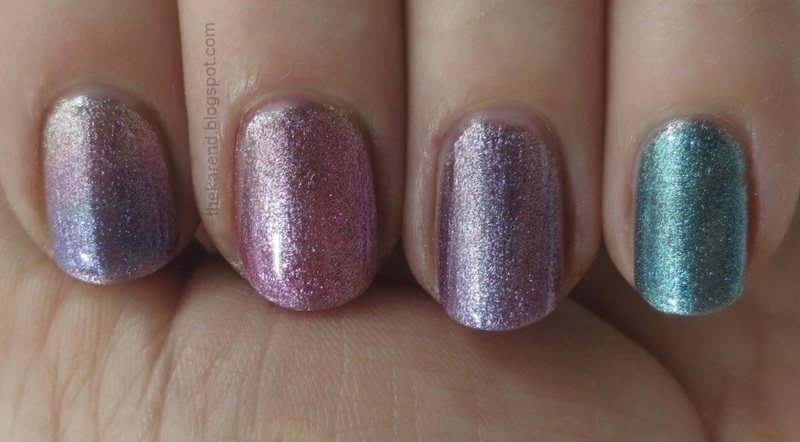 Overall, I was disappointed with how these looked on the nail versus how they looked in the bottles. I knew they'd be sheer, but not as sheer as they turned out to be. Look at the color circles on the display; those are lighter than the bottle colors but not that much, so apparently they based those on using many coats of color. I guess the "jellies" in the collection name led me think they'd be more like the L'Oreal Miss Candy Gellies, though that was dumb, since quite clearly they're more transparent. (Hah, clearly ... transparent ... I amuse myself.) I still want to play with them more, though. Maybe I'll leave the tops off the bottles for a while to thicken them up and hope that gives me a better color payoff. In their favor, they were not streaky, even the ones that I used only two coats of. Of course I did some comparisons between the OPI Sheer Tints and these Sally Hansen Palm Beach Jellies, but since I also dragged out my Maybelline Water colors and some of the L'Oreal Miss Candy shades and even the two sheerest Essie hues in my stash, those comps are going to have to go in their own post. Look for that tomorrow or Friday. 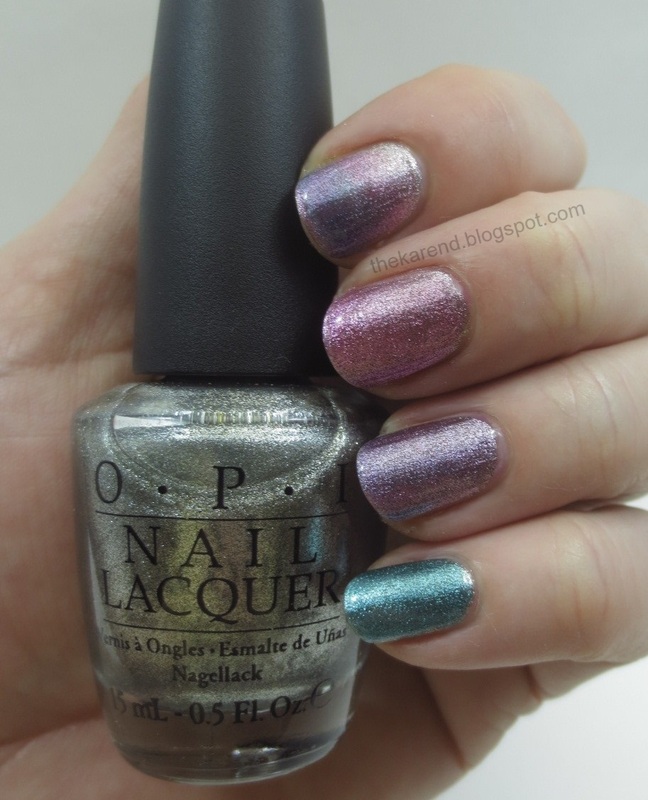 OPI seems to be releasing a lot of different products for this spring season. 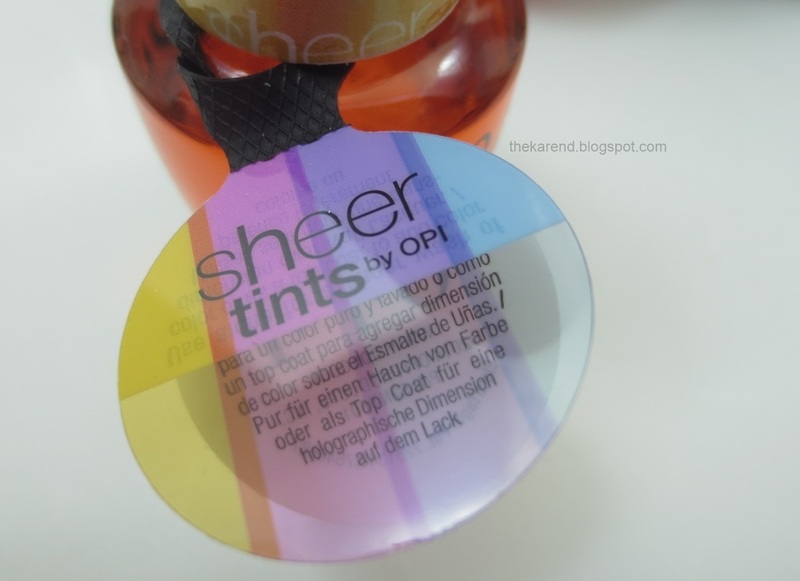 Today I've got their Sheer Tints collection, which they sent to me for review. There are four see through shades in this group (left to right below): I'm Never Amberrassed, Be Magentale With Me, Don't Violet Me Down, and I Can Teal You Like Me. I've never seen an OPI bottle with a white cap like these; with the colored overwrap on them, it's a very pretty and bright effect, very fitting for spring. 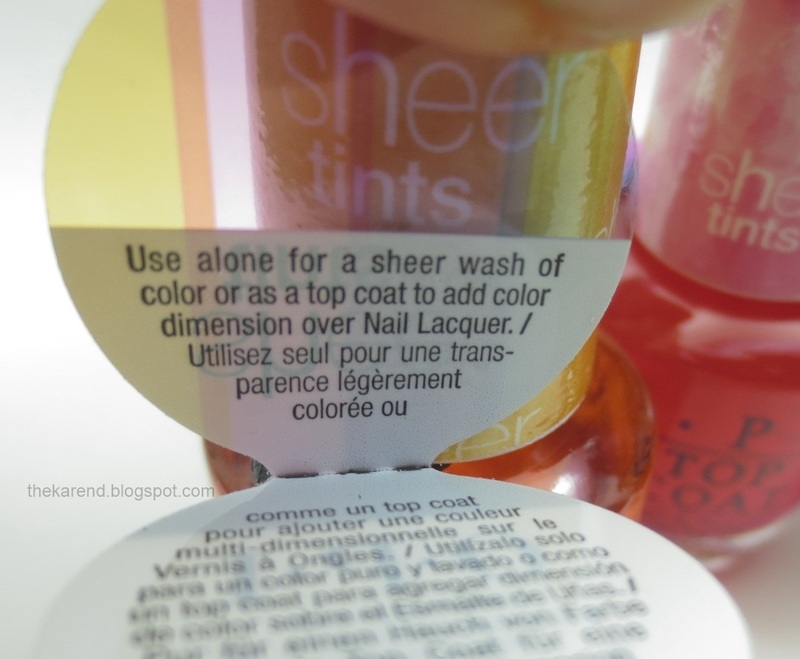 The hang tag says these can be used by themselves "for a sheer wash of color" or over another polish "to add color dimension". Looking at these, I was reminded of the old Maybelline "water" polishes (in the Express Finish bottles with the gold caps). I didn't tend to wear those on their own because they were very sheer and tended to look more like my nails were stained rather than intentionally painted (results varied by color, of course). 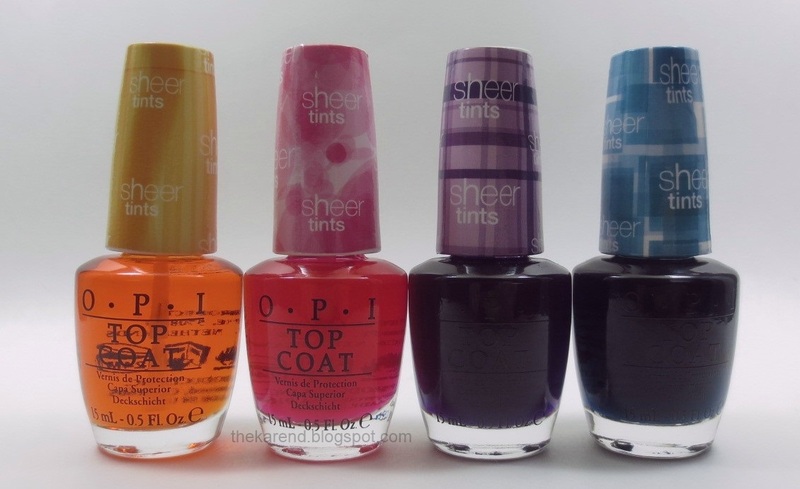 Despite that experience, I decided to start with these OPI Sheer Tints by swatching each by itself. The hang tag suggested that as an option, after all, and having only the four colors to do meant it was possible to accomplish that in my limited swatching time. I started with the yellow orange, I'm Never Amberrassed. I used two coats for my swatch and abandoned my plan to swatch these on their own right then, as this looked awful on me. If I'd used a semi opaque base underneath, like some ridge fillers are, that might have helped, but I wanted the polish to stand on its own. If I'd added another coat of color, that might have helped, too, especially if it brought out more of the orange tones that showed in the bottle, but the formula was so thick that I feared a third coat would just be gunky and cause bubbling. So there I was, with nails that looked like the color of the walls in a heavy smoker's house. Yuck. 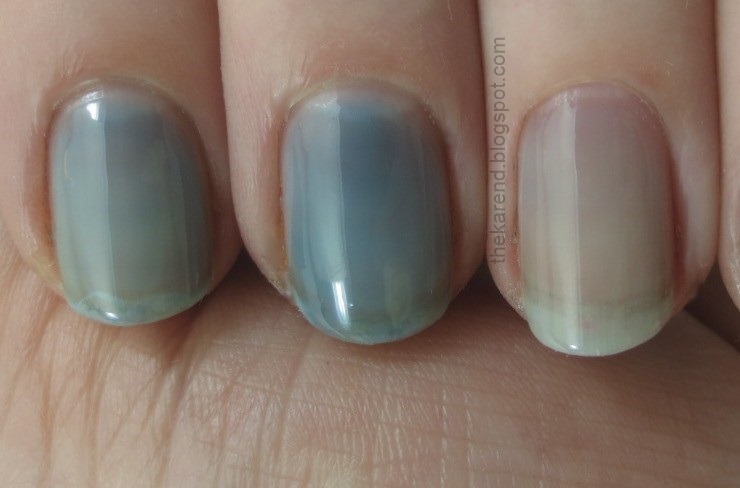 Usually I can look at a polish that doesn't work for me and imagine someone it would look nice on, but I'm not sure who this would work for, not worn this way. But I pushed on and tried Be Magentale With Me, which is a rosy pink. Again I did two coats, as this had the same thick formula (really thick, like thicker than a heavy duty glitter filler topcoat thick). This looked much better than the yellow, since it looked more like I'd been eating raspberries than smoking like a chimney. Still, I wouldn't wear this like this, as it gives a "dirty nail line" impression even though my nails are clean (thanks to Lizzy for introducing me to the term). I Can Teal You Like Me is as green as the name implies; it's pretty much blue with ever so slightly green-leaning tendencies. Same thick formula, same two coat swatch as the other colors. I saved what I was sure would be my favorite for last, the purple, Don't Violet Me Down. I certainly liked the color, but I wouldn't wear this one on its own either, at least not at the two coats I swatched it at. Sheer color is just not my look. Okay, so at this point, it was clear that option one, wearing alone for a sheer wash of color, was not for me. So let's try option B, layering to add color dimension. 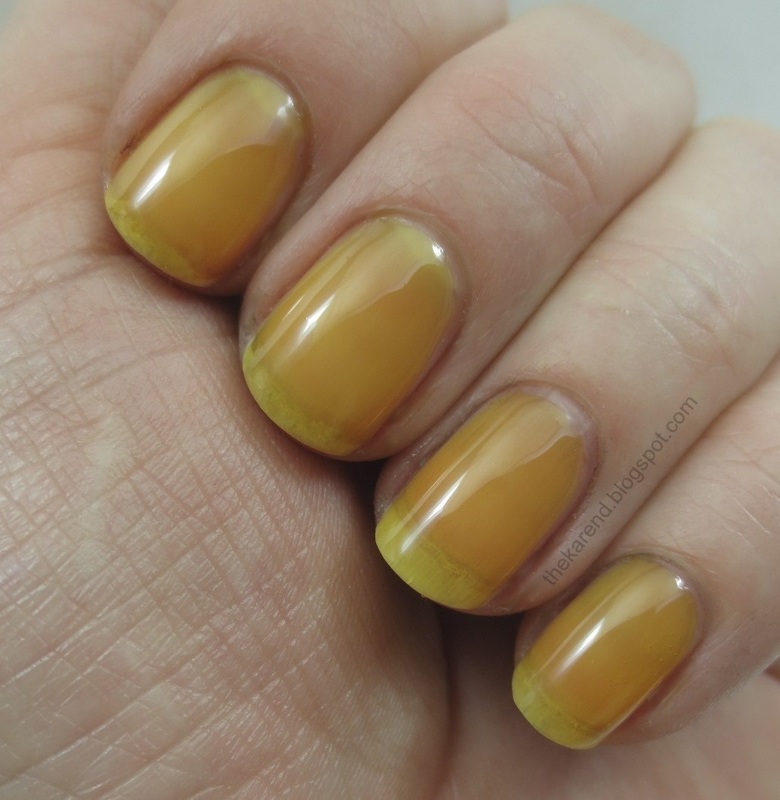 To let the tints show their true colors to start, I laid down a base of OPI My Boyfriend Scales Walls, which is very nearly white (I couldn't find my bottle of Alpine Snow), then added two coats of the tints, starting with Amberrassed on my index finger. 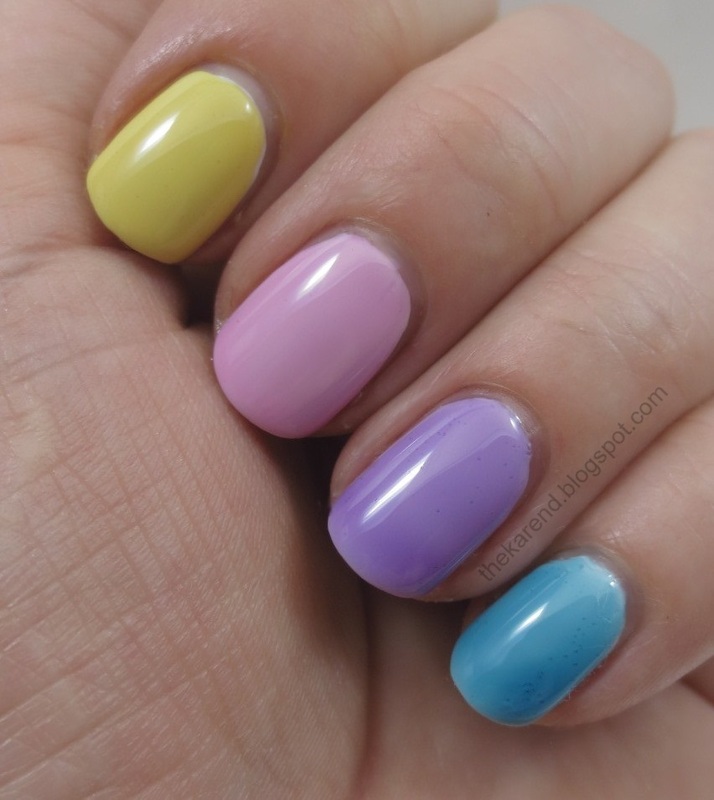 Now this look I'd wear—it made me think of spring and Easter candy. For my next layering experiment, I put down a base of OPI Samoan Sand, which is nearly mannequin hands on me (do people still talk about mannequin hands? or am I dating myself? maybe "Band Aid but better" has come back into vogue?). Then I put donw a coat of the Sheer Tints, added glitter polish, then topped with more Sheer Tint. 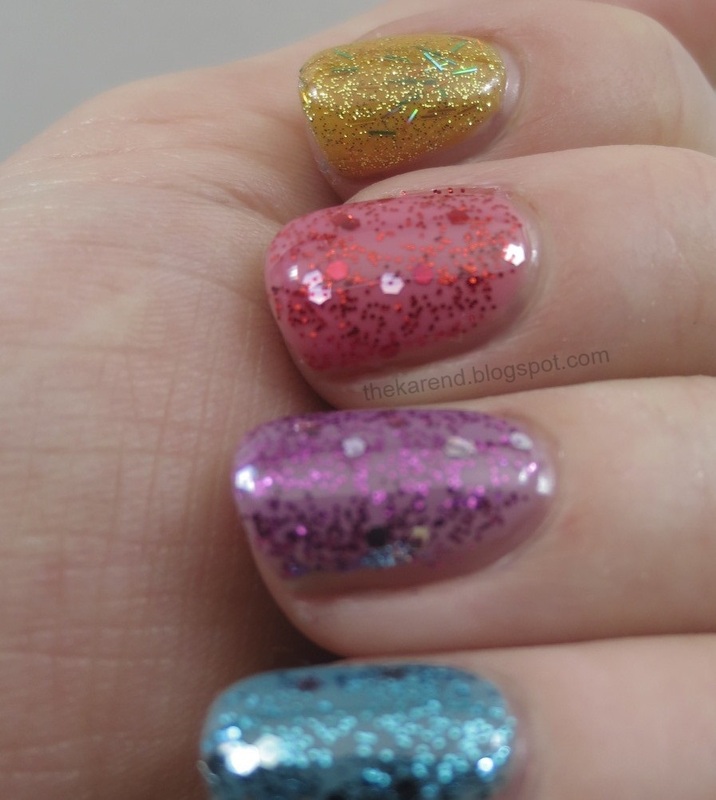 Left to right below: Amberrassed sandwiching OPI Save Me, Magentale with OPI Gettin' Miss Piggy With It, Violet with OPI Divine Swine, and Teal with OPI Gone Gonzo. The skintone base tones down the colors of the Sheer Tints, makes them less Easter candy-esque. For my last trick, I tried some of the Sheer Tints over a metallic silver, namely OPI Your Royal Shine-ness. On my index finger, I tried a gradient with Magentale, Violet, and Teal. The other fingers got single colors; I used three coats of Magentale and two of Violet and Teal. This base did bring out more of the green tones in Teal. Unfortunately that was all the playing I had time for in this swatching session, but I can think of other things I'd like to try: other gradient combinations, other base colors, layering the Sheer Tints over each other in various pairings, different sorts of nail art (splatter mani, watercolor mani, etc.) 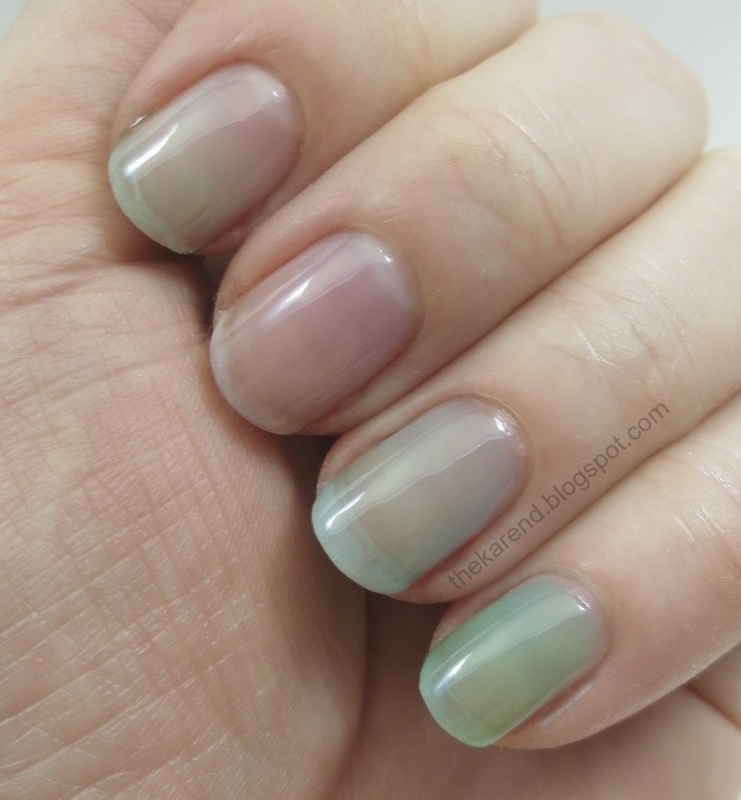 My only hesitation is the thick formula, which makes building up lots of coats tricky and prone to bubbles, as you may have spotted in some of the shots above (see the Violet and Teal nails over white, for instance). I'm not sure why these are so thick; the Maybelline water ones were not. Perhaps it was meant to better suspend the pigment and make them less prone to streaks? I guess using thinner is an option, but I think I'd have to use a whole lot of it before these got to a consistency more like normal topcoat. I have yet to see these in any store, but they are on the Ulta website for $9 a bottle (noted as online only), and I've also found that some other websites have a set of minis with one of each color. 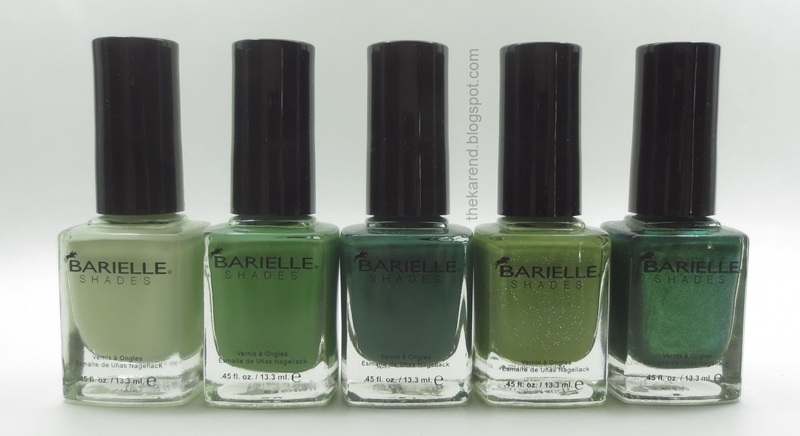 At the same time as they sent the New York Style set that I reviewed in my post last Friday, Barielle sent their Earthy Greens set. The packaging leads me to believe these might have been an Earth Day tie in at some point, but I thought St. Patrick's Day would be the perfect time to share them. The five shades here are Mint Ice Cream Cone, Green With Envy, Teaser, Myrza's Meadow, and Lily of the Valley. 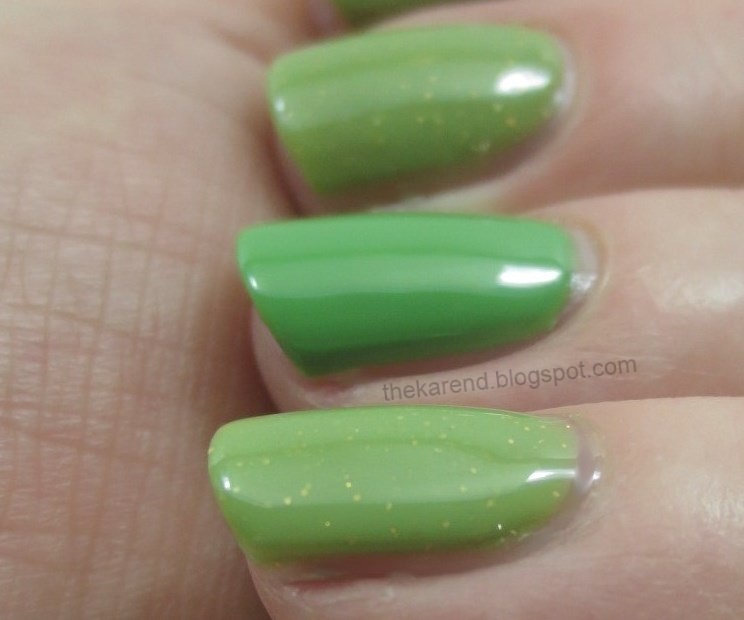 Myrza's Meadow is a creamy lime green with golden glitter. 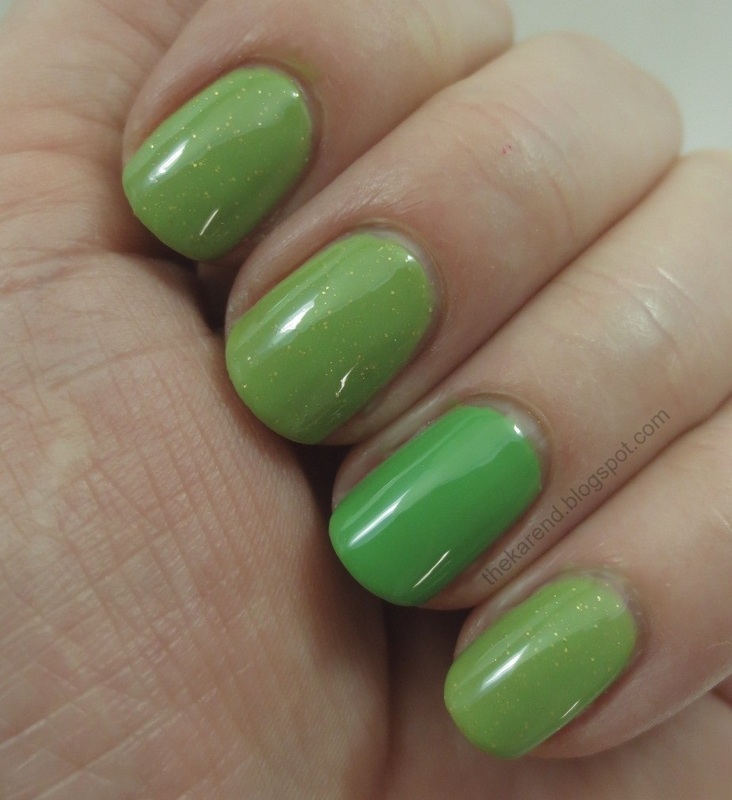 I gave it an accent of Green with Envy, which is a warm green creme. 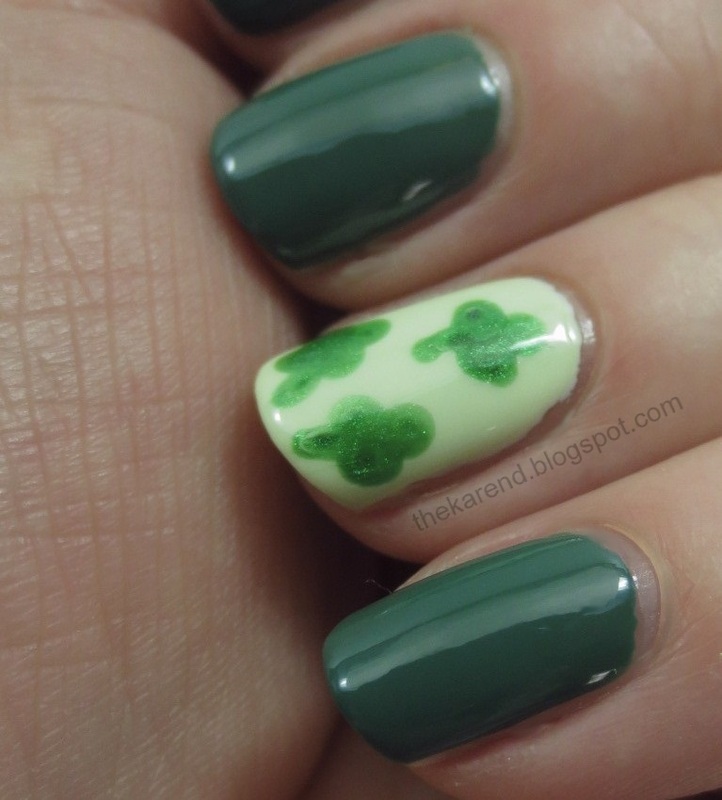 I used three coats of each, though Green with Envy I could have stopped at two. I added topcoat to Myrza's Meadow as it seemed to need it to smooth the surface because of the glitter; Green with Envy is shiny on its own. Teaser is a deep green creme. It's quite opaque; I nearly stopped at one coat but went ahead and did two just to be sure. 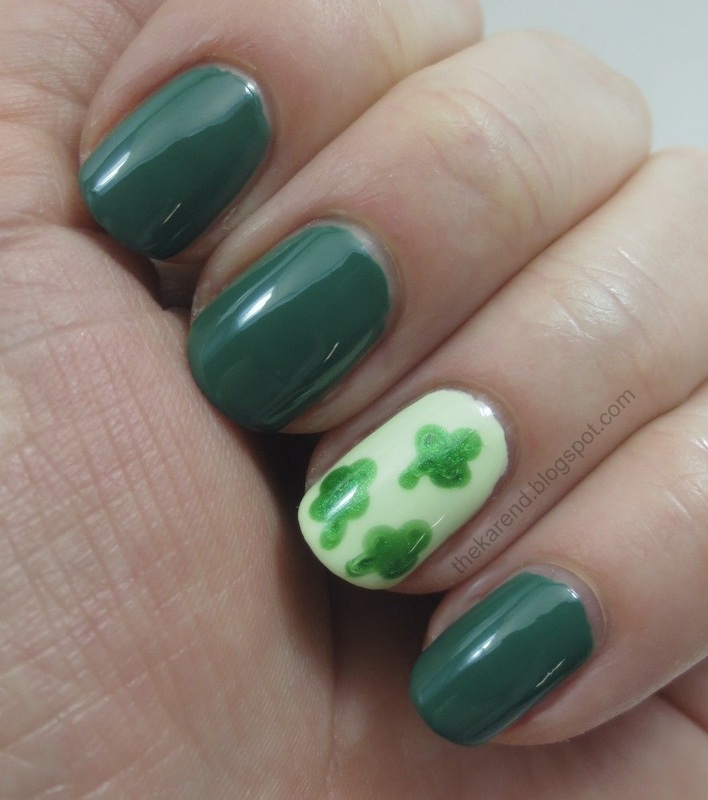 For my accent nail, I laid down a base of two coats of Mint Ice Cream Cone (which I swatched by itself last summer, and looking at that I can only hope this coming summer my nails will once again get strong enough to grow that long) and added some rather lopsided shamrocks using my dotting tool with Lily of the Valley, a green shimmer (which I swatched by itself in summer of 2012, and my nails were doing well then, too; it's hard to remember that in the midst of winter peelies). 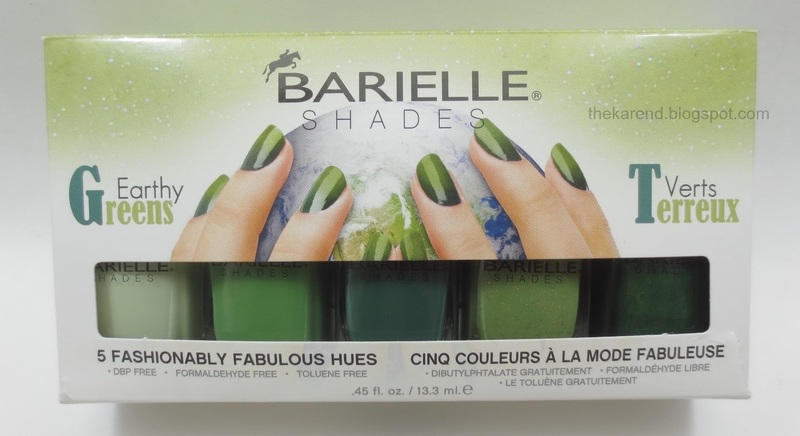 This pack is available on the Barielle website for $25 (though the shades listed there aren't all the same as what was in the pack I got, so I'm not sure what's up with that).